A student capturing digital images using her own smartphone. Teaching introductory biology classes presents a number of related challenges including large class sizes, the diversity of student background knowledge and interests, and therefore low student engagement. Therefore first-year biology courses need to instil in students a sense of scientific discovery instead of just delivering content, while providing safe avenues for authentic inquiry-based learning to engage students. A further challenge for plant scientists is students’ relatively low innate attraction to our subject material compared to the study of humans or furry animals. In 2011, I was fortunate enough to be involved in the redevelopment of the two flagship first-year biology courses at the University of Sydney, with over 1400 students enrolled each year. In particular, the practical curriculum was composed of demotivating, cookbook style practicals which needed refreshing. A plant molecular and cell biologist by training and an educator and technologist at heart, this opportunity allowed me to infuse plants into various parts of the curriculum to promote the relevance of plants and subtly change students’ perception of them. We can’t turn every student into a plant scientist, but we can instil a deeper appreciation of plants by presenting them in an interesting way. 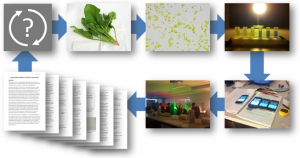 A number of new inquiry-based experiments were developed, where students led their own investigations by using a mixture of digital imaging, enzyme assays, fluorescence microscopy, live organelle isolation and analysis, live tissue preparation, and investigation of whole-organism physiology. Although these practicals covered a range of concepts and competencies, they were structured (scaffolded) to provide a safe environment for students to build their laboratory and scientific thinking skills which were then applied to the design and analysis of their own open-ended experiments through which they could develop a strong collaborative ethic. Because students were invested in their investigations, they were more engaged with the subject material and, notably, better understood and appreciated the relevance of plants. Pragmatically, these practicals were designed to be cost-effective, easy to implement, and adaptable. What follows is a description (which is by no means prescriptive) of some of the inquiry-based, plant-flavoured practicals in the redeveloped courses. At the beginning of their first semester of university biology, students were introduced to basic laboratory skills and experimental design principles in a number of practicals where plants were emphasised. The first practical leveraged the inherent curiosity of all students by providing them genuine choice in the samples they wanted to investigate, which included some more ‘active’ plant specimens – such as motile Chlamydomonas, cytoplasmic streaming in Egeria, and the spiral chloroplasts in Spirogyra. 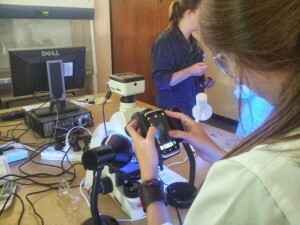 Students were encouraged to capture images and videos using camera-equipped microscopes in the lab, as well as using their smartphones (by positioning the camera over the ocular). Students were also given the opportunity to perform some basic 3D reconstruction of the Spirogyra chloroplast from bright-field images (see video on right). We showcased student videos on our official YouTube channel. Subsequent practicals scaffolded other biological competencies such as liquid handling techniques, spectrophotometry, and running assays. These practicals were given real-world relevance using plant-based questions – for example, a simple phosphatase enzyme assay was contextualised as an investigation into the influences of fruit ripening or rhizosphere microenvironment on phosphatase activity in agricultural crops. These investigations were given gravitas by being grounded in journal articles that performed similar research, with which students wrote a short discussion article and integrated their experimental results. Students worked in groups to collect a class dataset, and were also guided through experimental design principles. Building on these skills, students were then able to perform an open-ended experiment to investigate the effect of light quality/quantity or herbicides on photosynthesis. This capstone-like project involved students working together in groups to design and conduct their own experiment, using the experimental design, liquid handling, spectrophotometry, microscopy, and other skills gained in previous practicals. Due to the large enrolment, we had to take into consideration some procedural practicalities and design for assessment consistency – for example, students were offered a constrained set of variables and materials upon which to base their experimental design. Nevertheless, students appreciated collaborating and taking responsibility for their own investigation, and most groups were able to develop independent experiments. Based on their own data, students then prepared a scientific paper and integrated their work with the existing literature. Some of the crucial design principles were to focus on research and inquiry, as well as for students to be involved in the entire lifecycle of the experiment. After being provided a general topic and basic protocols, students took control of the experiment and designed their own question and hypothesis, and decided on the experiments to collect the necessary data. When performing simple assays on photosynthetic activity of chloroplasts, students first isolated the chloroplasts themselves from living tissue before assaying their activity. This way, students engaged with the process of science and better understood the lifecycle of research. Students are more engaged if they are involved in the entire lifecycle of an experiment. This includes designing the experiment, preparing the biological samples, performing the experiment, and analysing and communicating their findings. In the second semester organismal biology course, the inquiry-based experimental theme was continued in two plant-focussed practicals where students were given freedom to explore plant anatomy and physiology. The first practical in this set involved plant anatomy, where students could choose to investigate tissues from a number of live specimens using various staining techniques (such as toluidine blue, acridine orange, and unstained). Student images of plant anatomy, stained with toluidine blue. Left: pavement cells in tomato leaf epidermal peel; middle: lateral root formation in transverse section of pea root; right: xylem thickenings and various cell types in transverse section of tomato stem. Students were invited to explore plant anatomy and to build their understanding of the structure and function of cell types and tissue systems. Specimens that were both easy to section and had visually striking tissue anatomy were selected (including Coleus, Begonia, snowpeas, tomatoes) in order to build students’ confidence and engagement. Through their exploration, students discovered pavement cells, trichomes, cell nuclei, xylem thickenings, lateral roots, chloroplast, nodulation (in the snowpea roots), and more. Through the use of digital media, students were encouraged to capture and share their images. The curiosity and skills were then applied to the subsequent practical, where students were again involved in the entire lifecycle of an experiment. In groups, they designed their own experiment and selected materials to gather data on the effects of abiotic and biotic factors on transpiration, applying their newly-developed skills in specimen preparation and integrating their understanding of plant transport systems as well as leaf and stem anatomy (from lectures). Students used pea seedlings and a fluorescent tracer dye to independently test various factors that contribute to transpiration, including wind, light, mechanical perturbation, and leaf area. Again, a collection of simple materials was provided, and the scope allowed groups to design and perform fairly original investigations. Students using blacklights to visualise a fluorescent tracer to investigate transpiration in pea seedlings. The ends of stem segments fluoresce due to the acridine orange present in the transpiration stream. This is dramatically visible as stained xylem in transverse sections. The redeveloped practicals were student-centred, inquiry-driven and research-enhanced. This focus has been recognised by a number of other awards to members of the teaching team, including a Faculty of Science Learning and Teaching Award in 2013 and an Office of Learning and Teaching Citation for Outstanding Contributions to Student Learning in 2013. Also, the enrolment in intermediate botany and a number of other biology units have doubled after the introduction of the redeveloped practical curriculum, although a number of other factors may be influencing this. Most pleasing of all, students themselves frequently commented that learning and then independently applying scientific skills, as well as collaborating with their peers to investigate an authentic question, produced a much more fruitful and engaging learning experience. In order to address waning student interest in biological sciences, we must firmly turn our backs on cookbook-style practicals and develop engaging new investigations that are centred on student involvement and independence. In doing so, plant scientists have a great opportunity to infuse plant-related scenarios and experiments into the undergraduate curriculum. Particularly, some of the key affordances of plants are that they are readily available, easy to manipulate, and their biological significance extends everywhere that life exists. Being able to enthuse students about biology, and in particular plant biology, is sufficiently rewarding in itself. Through my teaching journey, I am indebted to all the students who have essentially been the beta testers of these new practicals. I also want to thank the academic and technical staff in the School of Biological sciences, who have been invaluable in supporting the redevelopment of these practicals. In particular, Charlotte Taylor has been an amazingly supportive mentor – this would not have been possible had she not agreed to throw out the old curriculum and start afresh.